Store more with this ultra capacity French Door refrigerator. Smart Cooling system is designed to monitor and maintain conditions to help keep food fresh. The LG Slim SpacePlus Ice System provides the most shelf space. With over 24 cu. ft. to work with in this LG French Door Refrigerator, you have an abundance of space for all of your food storage needs. The SmartCooling System means all your food will stay fresher, longer, and you don't have to sacrifice space for functionality thanks to the Slim SpacePlus Ice System. Sleek, stylish French doors with hidden hinges make it easy to get food in and out whenever you need it. This product contains a chemical known to the State of California to cause cancer or reproductive harm. For more information, go to www.P65Warnings.ca.gov. Does this have an alert button sound when doors are not shut tight? My old refrig' did and I could not believe how often I left the door not completely shut. I NEED this feature. Refrigerator model LFX25974SB. Does this model have an &quot;Ice Maker&quot; in the freezer also? No, which is nice, as you have more room in the freezer. Does it have cubed and crushed ice? How often does ice maker make and dump ice? 24.1 cu. 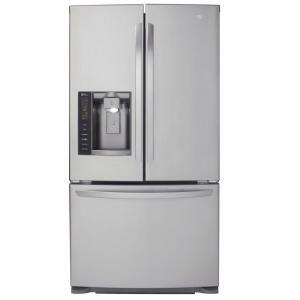 ft. French Door Refrigerator in Stainless Steel is rated 4.1 out of 5 by 867. Rated 5 out of 5 by bandman1967 from LG LFX25974SB We have had this refrigerator for 6 months. I am wondering if a lot of people who really like it as I do, just don't have time to write good reviews. While the filter for the water is a bit pricey to replace, the quality is typical for LG, that is why I bought this for my upcoming retirement years. It has been dependable. The quality is first rate and I can frankly say that is seems to be the best refrigerator we have ever had! As with all new technologies the water dispenser takes a while to get used to but at least mold doesn't build up like in our older fridges. I think with this new information age a lot of people is just easier for the people who gripe about everything to be heard. Usually I don't have time to type reviews but I felt compelled to this time because I think this refrigerator is a best buy. Whenever I call tech support they are happy and do assist, but I think the key thing here is "attitude" when communicating to get something resolved. A little positiveness can go a long ways. Rated 1 out of 5 by Elena from Please don’t but LG - Big Issues with Compressor I purchased a French door Dec 2016. I noticed that the fridge made a loud noise and I called LG they said that the problem was the doors (not properly aligned). I paid someone to make sure they were properly installed and aligned and the noise went down a little. Las week the fridge stop working completely. I called Home Depot (I purchased the fridge there) and they said to call LG. I called LG about 10-15 times and as they just go around and sound and no solution. They said the compressor went bad but they can not have anyone within 3 hours from my house to service them. I decided to search online about LG compressor and found out that there is a class action suit due to the poor quality of the part. Some people even mentioned that LG replaced the compressor but they had to pay for the installation which runs from $300-$500 only to find out that the new compressor is just as bad as the original. Please do your own research and buy a different brand. Rated 2 out of 5 by KATIE from Love the Fridge but the service from HOME DEPOT was and is horrible. 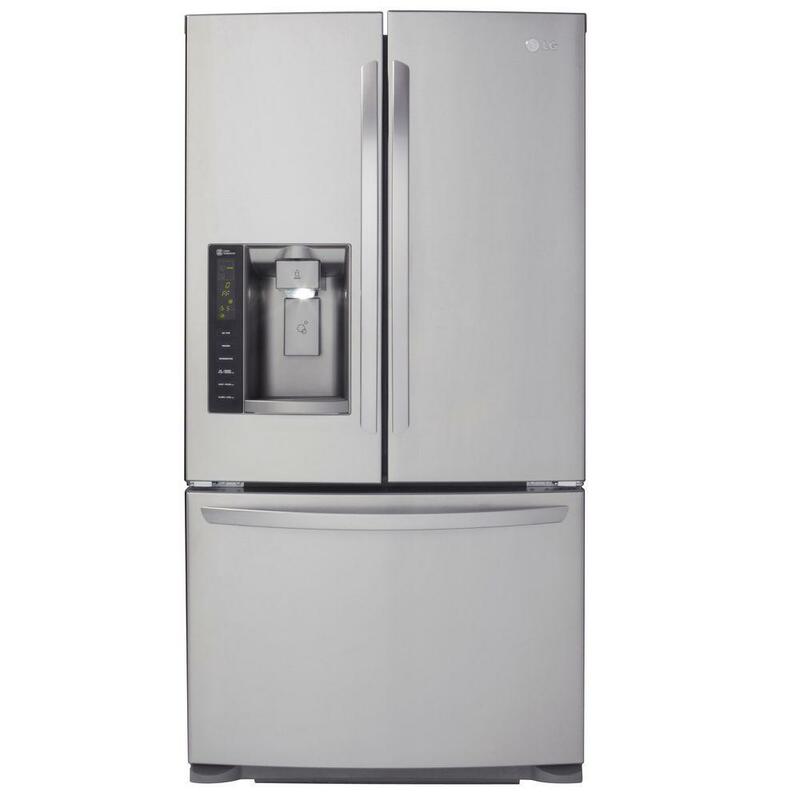 Ordered this in store and it... Love the Fridge but the service from HOME DEPOT was and is horrible. Ordered this in store and it was delivered a week later. It didn't fit through a small area in my kitchen so i told the guys leave it out back because my husband would find a way to get it in. Once we got the fridge in ( had to take doors off as stated in manual for tight spaces) we put it all back together, plugged it in and it worked fine. Hooked up water line. that also worked fine. They told me i had 24-48 hours to call them in case i changed my mind ( return or damage ). Also the ice maker states it needs 24-48 hours to make ice. So i waited and waited and waited and the ice maker never turned on... never made ice. I've been calling home depot because i bought their so called "warranty" which is trash. they keep giving me the run around for days. I had enough and my husband finally called again and they said a tech should be coming out. Guess i have to wait and see if they actually fix this issue. definitely not a great experience as i expected. Rated 1 out of 5 by Kirsten from We have had nothing but trouble with this fridge. From day one, the ice maker did not work. We ... We have had nothing but trouble with this fridge. From day one, the ice maker did not work. We contacted LG, which was a struggle and their initial solutions involved 'is it turned on' 'shake the ice maker for 30 seconds' and 'unplug and plug it back in'. Obviously these 'solutions' did not work (I mean in actuality, do they ever?). They then told me to wait another day and call back if the problem persists. So I called back when, unsurprisingly, it persisted. They sent someone out who looked at it for approximately 3 minutes and determined a part was needed and it was another 2 weeks until they came to repair the issue. So they came yesterday to make the repair. Now the ice maker still doesn't work but we have the added bonus of the water dispenser not working and leaking out the back of the fridge instead. Should have never bought this LG fridge. I am hoping they can soon resolve the issue or I will be returning it and getting a new fridge by another company. Rated 4 out of 5 by MayBabiesMommy from Really nice frig! We bought this refrigerator when we moved into our new home. We had a french door style in our old house and we moved into the new one, it was a side by side. Well, once you get used to the french door frig, you won't want anything else! I can fit a lot in this frig, the freezer stays nice and organized and its super quiet. I like that the ice and water have a lock and all the controls for temp and other things are very easy to use. My only complaint is the ice cubes are super small and the amount that the tray makes at one time is insanely small. Luckily we don't use a lot of ice, but when we have company, it tends to run out pretty quickly. I like that the ice maker doesn't take up a lot of room and its easy to access, though. Also, the location for the water spout is stupid, when we have guests who want water, they always put their cup under where the ice comes out and then they push the water button, which then makes the water shoot on the floor. All in all, we really like the refrigerator! Rated 1 out of 5 by indyhank from Defective ice maker design I bought this fridge in November 2011. Seemed like a very nice unit and the space was great. Well, to free up space on the left side of the fridge part and on the left door, the ice maker was designed to be super narrow, and therefore the ice bin is super narrow. All ice bins have ice cube clumps, but "normal" wide bins have enough space for the loose cubes to make their way past the occasional clump of cubes. NOT in this bin! One clump and NO cubes get down the chute. Every day after I came home from work, 95% of the time, ice would not drop down the chute. I would have to open the left fridge door, open the icemaker access door and BANG on the ice bin to loosen the day's clump so that ice could dispense. Excellent local service company sent out a very knowledgeable tech and he called an LG engineer to consult. Bottom line: nothing can be done. Great customer service from Home Depot, however! They took the fridge back and refunded my money. I think that if the ice dispenser is used several times a day, every day, ice won't have time to clump and the dispenser may work okay.